It’s nice to have guests once in a while, especially around the holidays. Today we welcome Elio Schaechter and Merry Youle. They first wrote and posted this piece on the exquisite blog, Small Things Considered. The story is too good to miss; it is duplicated here with permission. A spore print of an Agaricus. If you’re not into mushrooms, you don’t know what you’re missing. (Find out what I mean by having a look at my book on the subject.) When hunting for wild mushrooms, all your senses will be satisfied, and so will your scientific curiosity. Consider the dispersal of fungal spores and the variety of ways that fungi have evolved to do it. Some use wind transport, others employ water droplets, yet others induce insects to carry their spores for them. An amazing world. Here we will contemplate how mushrooms do it. As a kid, you may have made a spore print. For those who haven’t and to remind those who did, a spore print is what you get when you take a mature mushroom, cut off the stem, and place the cap (gill side down) on a piece of paper or plastic. 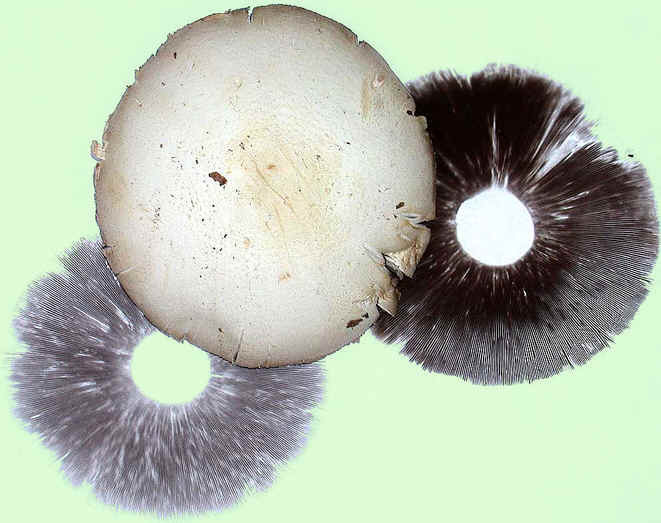 If all goes according to plan, after an hour or so, you’ll see the spores deposited on the paper in a pattern that corresponds to the spaces between the lamellae or gills on the underside of the cap. How did this happen? There is magic here. Since the gills are usually moist, the spores have to clear the gill surface to avoid getting stuck there. The mechanism for carrying out this feat has been further elucidated in recent years by Nik Money and colleagues at Miami University in Ohio and Anne Pringle, now at Harvard. One of their tricks was to use an ultra high speed video camera, one capable of upwards of 200,000 frames per second. This permits investigators to observe events that happen at very high speeds. The discharge from the gill surface proceeds at an initial speed of some 1500 μ/msec and at an acceleration greater than 10,000 times the force of gravity, which is impressive. But the spores have a problem. If they were to travel too far, they would hit the surface of the adjacent gill and nothing would be gained in the process. 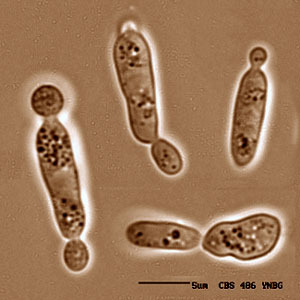 Actually, spores pop from their mother gill fast but they do not go far. After traveling about 0.1 mm, they abruptly lose momentum and fall straight down. Outdoing baseballs thrown by the best of pitchers, they change direction suddenly from a horizontal trajectory to a vertical one-the ultimate in curve balls! A nice account can be found on the Website of the Australian National Botanic Gardens. So, how do these spores (also known as “ballistospores”) get ejected? Here we’re talking about regular mushrooms, because other kinds of fungi have their own mechanisms. In mushrooms, the spores are made after meiosis by budding off a specialized surface cell called a basidium (hence, Basidiomycetes). Each spore is held in place by a thin peduncle (the sterigma) that breaks to release the spore into space. If you imagined that the force involved is osmotic turgor or gas pressure, you’d have guessed wrong (although this is the case for some other fungi). To visit the actual mechanism, we must recount the pioneering work from the early 1900’s by Reginald Buller, a Briton transplanted to Winnipeg. (An aside: It is said that in order to keep his eyes adjusted to dim light during work on bioluminescent fungi, he walked along the streets from the hotel where he lived to his lab wearing horse blinders.) 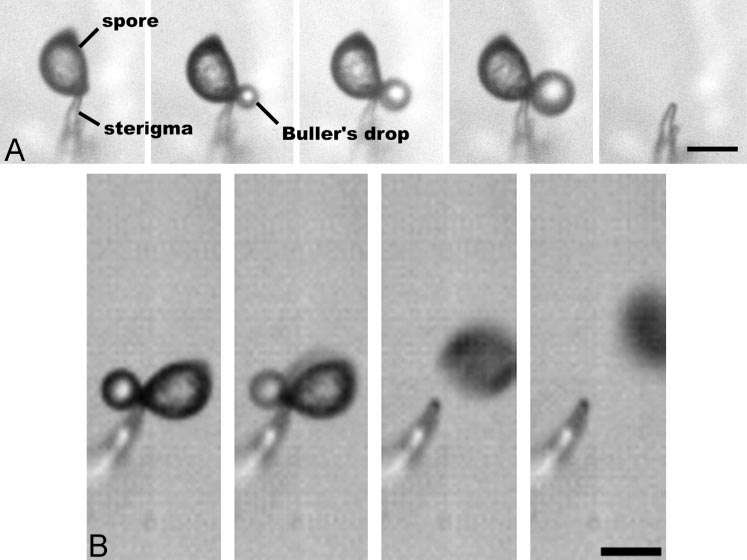 Buller noticed that, immediately before discharge, a water droplet formed at the base of the spore. The drop is formed by the secretion of mannitol and other osmolytes into the moist environment of the gills. What Money and collaborators observed with their ultra high speed camera was that this “Buller’s drop” grows until it abruptly coalesces with the water on the surface of the spore. This shifts the spore’s center of mass towards the gill, which is sufficient to detach the spore and release it into space. (Image 3 around here) In Money’s words: Fluid movement is powered by the reduction in free energy (surface tension) when the two drops fuse, so we refer to the mechanism as a surface tension catapult. I have been trying to find something analogous to this in everyday experience but have failed so far. Sticking to the baseball analogy and pretending that the spore is hit by a watery bat doesn’t work. Readers are welcome to contribute their own imagery. 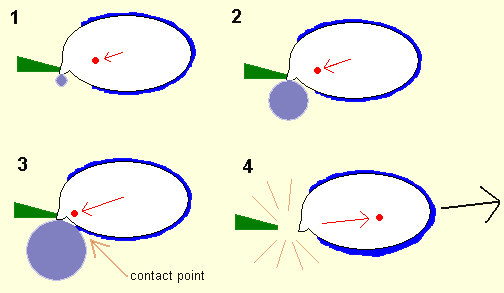 A Diagram of the Mechanism of Spore Discharge. (1 & 2) At its base, a spore secretes a small amount of sugar, which absorbs water, thus forming the Buller drop. The growing drop causes the center of mass (red dot) to shift as shown by the red arrow. (3) At the same time, moisture is also condensing on the spore surface (blue). (4) When the drop comes in contact with this surface film, it collapses, shifting the center of mass in the direction of the arrow and launching the spore. Source: Australian National Botanic Gardens, Fungi Website. Written by Heino Lepp, updated on web 25 June, 2007 by Murray Fagg. How mushrooms disperse their spores likely has you intrigued by now. But take it from me, this is only one of the many phenomena that will grab your attention, should you be so lucky as to get involved in any of the many facets of mycology. Our thanks to Nik Money for the movie and for generously sharing his wisdom and experience. Nik has authored several informative and entertaining popular books on fungi, viz. Mr. Bloomfield’s Orchard: The Mysterious World of Mushrooms, Molds, and Mycologists, Carpet Monsters and Killer Spores: A Natural History of Toxic Mold, and The Triumph of the Fungi: A Rotten History. My thanks again to Elio, Merry, and Nik for allowing us to cross-post. For more fascinating stories of small things, check out Small Things Considered.